In a small skillet, toast the celery seed over moderate heat, shaking the pan until fragrant, about 30 seconds; let cool. In a large bowl, combine the toasted celery seed with the tomatoes, cucumbers, jalapeños, yellow pepper, celery, red onion, tomato juice, Worcestershire sauce, hot sauce and lime zest. Refrigerate the gazpacho for at least 1 hour or for up to 2 hours. In a food processor, puree the avocado with the lime juice until smooth. Scrape the avocado mousse into a small bowl and season with salt. Cover and refrigerate. In a medium skillet, heat 1 tablespoon of oil. Add the scallions and red onion, season with salt and pepper and cook over low heat until softened, about 8 minutes. Transfer the scallions and red onion to a medium bowl and let cool to room temperature. Beat in the egg with a fork, then mix in the mustard, lime juice, Worcestershire sauce and hot sauce. With a spatula, gently fold in the crabmeat, then fold in the bread crumbs and season with salt and pepper. Form the mixture into 8 crab cakes and transfer to a platter. Refrigerate until firm, about 20 minutes. Preheat the oven to 300°. In a medium saucepan, heat 2 inches of vegetable oil to 350°. Set a wire rack over a rimmed baking sheet. When the oil is hot, add 4 crab cakes at a time and fry them until golden brown, about 2 minutes per side. With a slotted spoon, transfer the crab cakes to the wire rack and keep them warm in the oven while you fry the rest. Just before serving, stir the horseradish, lime juice and cilantro into the gazpacho and season with salt. Ladle the gazpacho into large, shallow bowls. 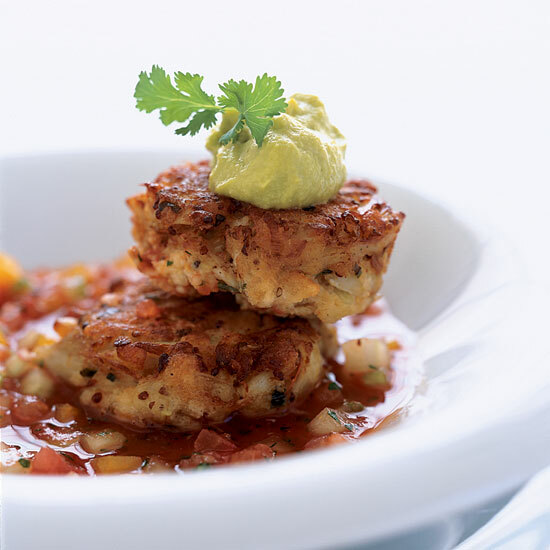 Add 2 hot crab cakes and a dollop of avocado mousse to each bowl and serve immediately. The avocado mousse and the uncooked crab cakes can be refrigerated overnight.